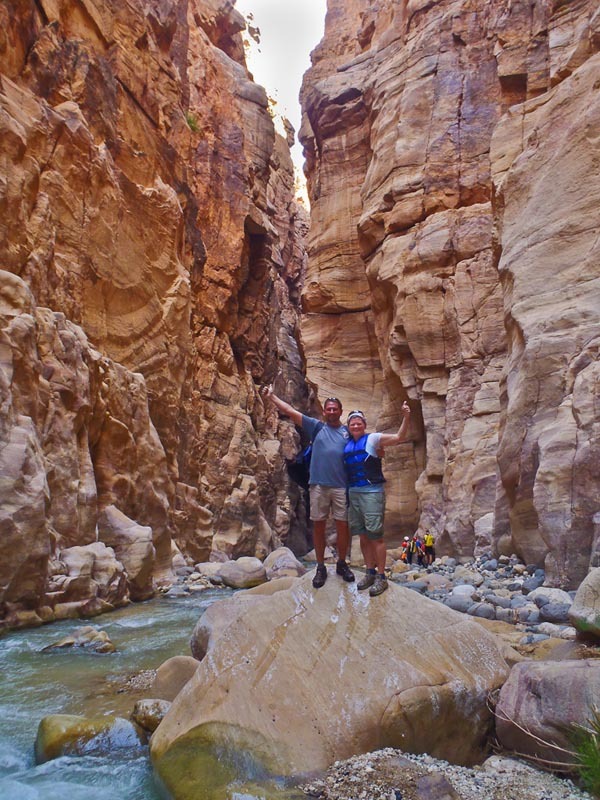 Trekking through the lowest nature reserve in the world turned out to be our most thrilling day during our time Jordan. The Wadi Mujib gorge houses some of the most spectacular cliffs we have ever witnessed and we were going to hike, swim, slide and abseil right down the centre of them all. 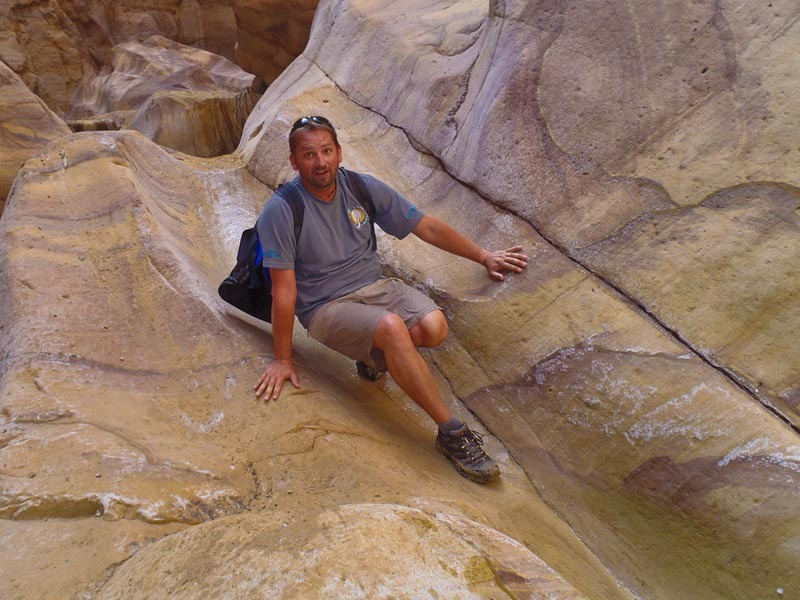 Operated by The Royal Society for the Conservation of Nature, (RSCN) A project that promotes the biodiversity of Jordan, this trek is eco tourism at it's best. 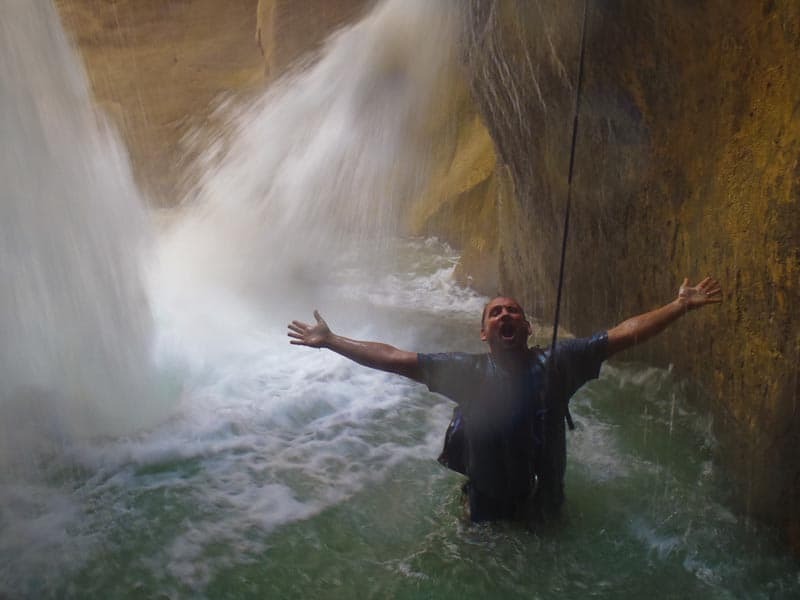 You can book your Wadi Mujib trek at the office right off the main highway between Aqaba and the Dead Sea resort area, and this is where our day began. Our adventure started at the crack of dawn when our driver Mahmoud picked us up from our Dead Sea Resort just 30 minutes away from Wadi Mujib. We were excited to be tackling the Canyon Trail today; The most thrilling trek of all the Wadi Mujib treks. We were a little intimidated when we met the rest of the group for our day on the water. They were decked out with wet suits and aqua socks while carrying full sized dry bags filled with harnesses and climbing ropes. GoPro – This is our go to adventure camera. If you want to capture the entire thing on video, this is the perfect waterproof, shock resistant and all round camera you can strap to your chest, head, or wrist. Dry Bag – I don't suggest bringing anything of value with you, but if you must, we always pack a small foldable dry bag to put anything in we don't want to get wet. It can then go inside your backpack. Quick Drying Clothes – We wear quick drying Exofficio clothing. Adventure zip off pants and lightweight breathable fabrics for shirts. Olympus Waterproof camera – For snapshots, GoPros aren't the best take along a waterproof camera to capture beautiful shots. We used to use the Olympus Tough and loved it. We've since switched to the sony system and for our Sony RX100 that isn't waterproof, we now use a waterproof housing instead. Throw in a couple of water bottles tucked into our zip off daypacks and that was the extent of our gear for the 4 hour hike ahead. 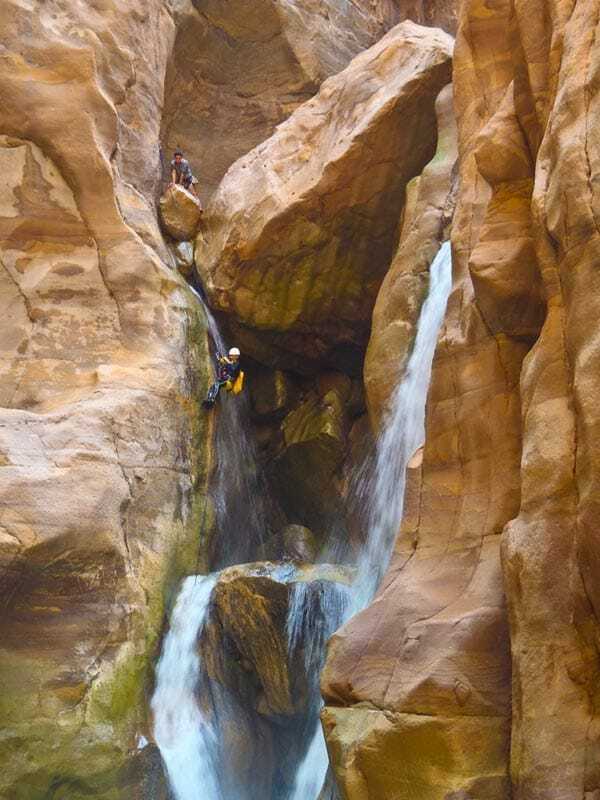 Excited for canyoning in Wadi Mujib..not long now! We were a little worried for our guide Ali though. He had been with us for the entire 10 days of our trip through Jordan taking care of our lodging and meals to organizing our tours and activities. He doesn't swim and this was a trip that was taking us through waterfalls and fast moving water. He didn't blink an eye when we read disclaimer stating that you must be able to swim to go on the canyon trek. He donned his lifejacket and said everything would be ok.
Ali Had a Great Time Even Though He Doesn't Swim! The start of the trip was a tough hike up an easy trail desert heat. The hill was steep yet manageable, but the sun was intense. It was already high and there wasn't a breeze to be found in the air. Our canyon guide assured us that within an hour we'd be feeling cool and comfortable. We descended into the gorge and came across the entrance of our canyon trail. As the rest of the group changed into their full wetsuits and helmets, Dave and I stood talking with our guides. They were both going through in shorts and a t-shirt so we felt better. The water felt cool stepped into the river and we instantly forgot the heat of the hour long hike to the entrance of the trail. Within minutes we were walking through the water carefully maneuvering our way through the rocky bottom. The Canyon Trail is heaps of fun. We climbed over rocks and slipped down natural waterslides of smooth rocks. We held on to ropes as we passed through some mild rapids and jumped into pools of calm water at the bottom of rocky dams. We never knew what to expect but simply listened to our trusty guide. When he told us to jump, we jumped. When he told us to slide we slid. And I am so glad we did. It turned out that our travel companions were very experienced canyoneers and had spent the last 10 days canyoning in Jordan. They were here to walk through its canyons and abseil into waterfalls. This was near the end of their Jordan trip and they decided to take a guided trip through Wadi Mujib. They were old hats at this stuff but seemed to be enjoying the trip almost as much as we were. They told us that there were plenty of gorges to be explored in Jordan and we made a mental note to come back and check them out. The plan is to make the Feynan Eco-Lodge our home base for these type of excursions. We whooped it up through the entire trip. The finale of the day came when we had the chance to abseil over a waterfall. We missed the opportunity in Fiji and in New Zealand, River Surfing was high on our list, but we didn't have the opportunity there as well. What we love about travel is that there is always another chance to fulfill your dreams and check an item off the bucket list. I have wanted to abseil over a waterfall since watching the Eco-Challenge Fiji way back in 2003. Now we finally got the chance. I decided to go first so that I could capture some photos of Dave and Ali. I have abseiled quite a bit, but I won't lie. I was a little nervous being lowered over a waterfall into a pool of rushing water below. I don't know what I was thinking volunteering to jump over first. I didn't mind the drop, it was the pool below. When I got to the water, I swam to a set of rocks under the waterfall and scrambled to the top of them to take off my harness and send it back up. I didn't even think of standing up in the pool and felt foolish when Ali came down after me and stood up once he hit bottom. Dave jumped over the cliff next followed by our group of canyoning enthusiasts from Germany. We had reached the peak of our trip and it was all a leisurely stroll back to the office. It is a day trip that you shouldn't miss when visiting Jordan. So when you find yourself at the Dead Sea, make sure to grab a taxi and make your way out to Wadi Mujib. It is the most unique adventure in the country and an excellent break from the tours through ancient ruins and historical sights. Many people think that this is all there is to do in Jordan, but you will find that there is so much more to this diverse and interesting country in the heart of the Middle East. We ate the Kempinski and spent an afternoon by their pool, now this is the place I'd choose for a luxury Dead Sea vacation if you want to go for more of a splurge. The Movenpick is also another beautiful resort located on the Dead Sea that is highly recommended. Get Your Guide offers day tours and Overnight Tours. 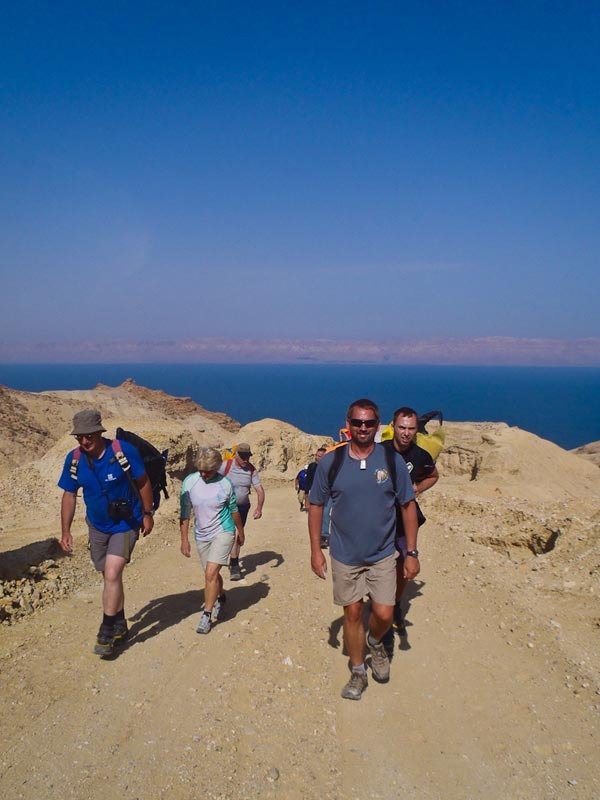 From Aqaba – Full Day Panoramic Tour including Wadi Mujib and Araba gorges, entrance to a 5-star resort on the Dead Sea and more. From Aqaba – Or you can take the 4 hour Dead Sea, Wadi Mujib & Wadi Araba that lets you see highlights of the area. 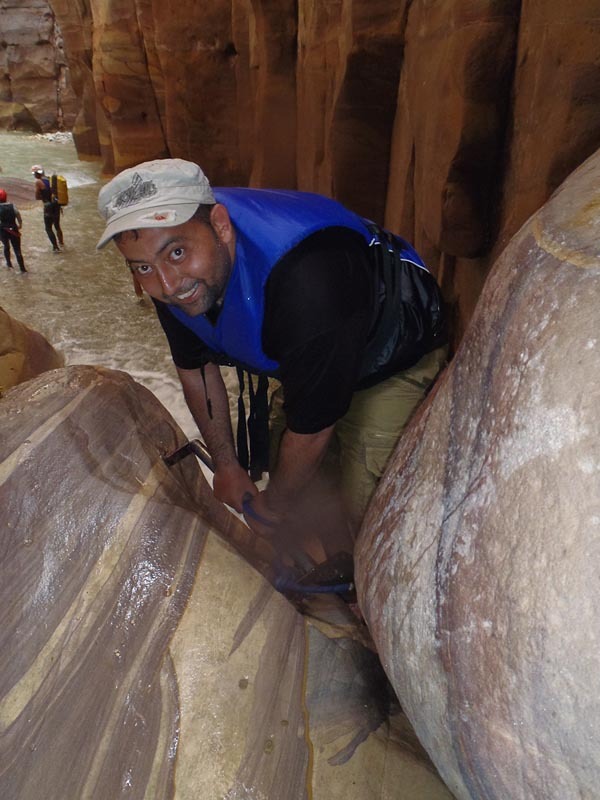 52 Responses to "Wadi Mujib Canyoning, Jordan, An Eco-Adventure Thrill Ride"
Is Wadi Mujib opened on 15 April ? 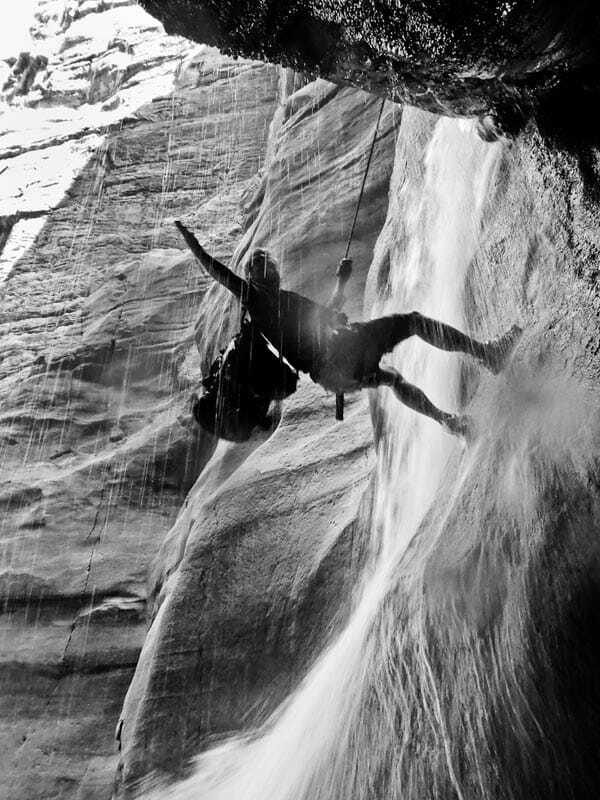 Rappelling down waterfalls looks like fun! Did you have to have special training for that? We did, it was one of our favourite things to do in Jordan. Definitely locking this in for next year! Might try and find out those other canyon areas too. We saw this some time ago, on the Discovery Channel film ‘Royal Tour of Jordan’ … in which the King of Jordan himself led a group up the canyon. Hi Keith, It was pretty amazing. How was Wadi Khuthera? 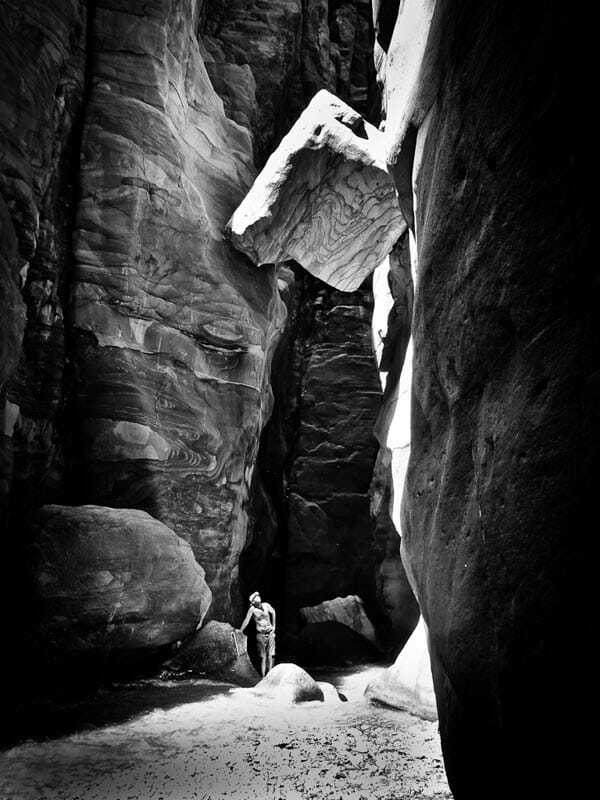 People that we were canyoning with had spend the last 2 weeks traveling around Jordan exploring Canyons. They said that they experienced some amazing ones. We’d love to go back and explore some more. I put some pix of Wadi Khuthera in a set at http://www.flickr.com/photos/[email protected]/sets/72157628230738629/. Not as good as yous, though; they were taken in 2002 & I had a very basic digital that rated about half a megapixel (I didn’t know what I would find, & wasn’t prepared to risk my Nikon! Thanks Keith. We know how you feel, we have so many photos from our travels pre 2004 on slide film. And our first digital shots weren’t the best either. But it’s awesome to have the memories and we’re looking forward to checking your photos out. I wouldn’t have risked my nikkon either. We used our Olympus Waterproof U Tough for these shots. It really takes great shots and no worries about water or shock. p.s. I love first picture. How many waterfalls was in this canyon? There was just the one large waterfall that we passed through and then there we several smaller ones. We went over 4 or 5 smaller ones (only a few feet high) that were still big enough that ropes were attached for safety. I was in another canyon and we passed 12 waterfalls from 5 to 45 meter high. Wow! That is awesome. 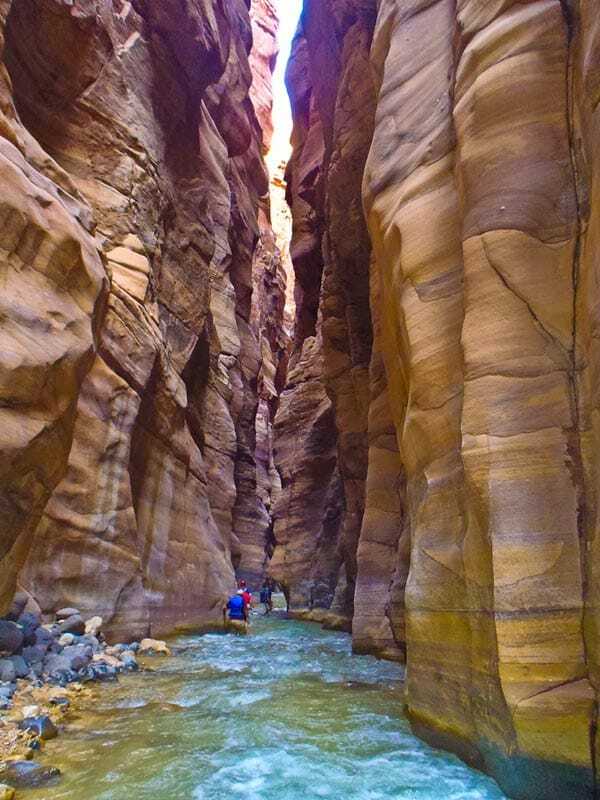 Like we said, there are several canyons in Jordan to trek through. The people we were with spent 10 days canyoning. I would love to go to the canyon that you went to. Did you rappel down them? It was Wadi Feid. We used ropes to get down as was no other way in most cases. That’s fantastic. We had heard of Wadi Feid. I would love to go back and really take advantage of the hikes that are available in the country. And I’d love to do a multi day camel trek. 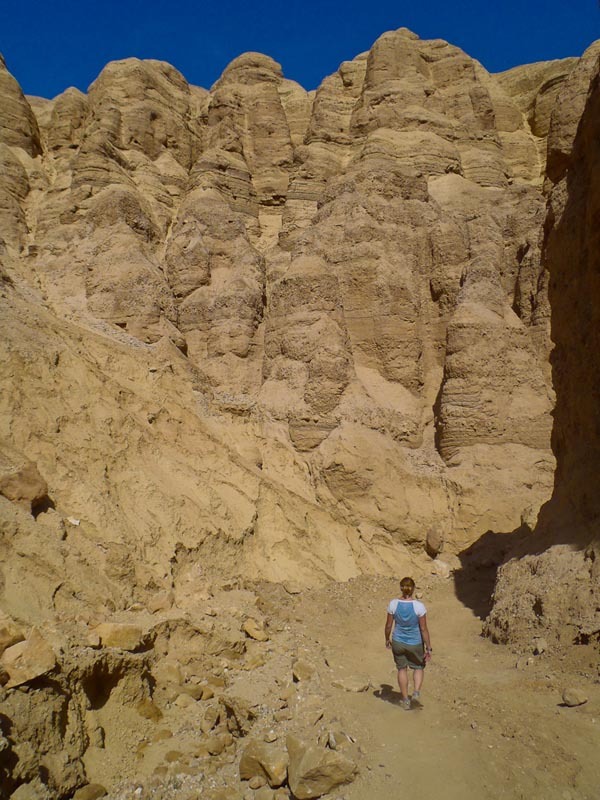 Check Wadi Hasa canyon too. You don’t need ropes where but canyon is very nice and what is amazing – water is warm. In some places probably it reach more then 30C. Wow, 30C! That’s my kind of swimming:) Thanks for all the ideas about where else to go canyoning in Jordan. Hi Christy. Yes, it’s known as rappelling too. I used to call it rappelling and I guess I haven’t done it at home in so long that I have gotten used to calling it abseiling. It was an awesome trip. Definitely a highlight of our time in Jordan. We like that sort of thing. Petra was nice, but Canyoning was awesome! Hi Grant. Ali spoke very highly of you! I hear that you had an amazing adventure in Jordan and that you were doing and excellent thing of promoting affordable travel in Jordan. We would have loved to do that full day hike that you did. Hope your doing well. I didn’t know that you were with Hostel Life now, congrats! Wow, what an adventure! That looks fun and exhilarating! I am not sure I am adventurousness enough to do that but what great views and landscape. Jeremy, you can totally do it. It wasn’t scary at all, just a lot of fun. Ali, our guide had never done anything like it before and loved every minute of it. Looks like you guys had a blast! Great photos. Thanks Gray, it was a blast, you will have to do it one day for sure. Beautiful, hiking through slot canyons is one of the coolest adventures! Have you guys ever hiked through a place called Antelope Canyon, near the Grand Canyon? I was there a few years ago and it has a similar look and feel. I’m getting itchy to get off the internet and go do some outdoor hiking! Hi Mark, no we haven’t done that hike. We were just saying how much we would love to see the Grand Canyon, believe it or not, we have never been there. We imagined that it looked a lot like the places we saw in Jordan. I am going to add it to my list. I think we will have to go for a hike this weekend ourselves. We’re back in Ontario and may have to head out to the escarpment. Looks amazing! When I saw the title, I just had to read it because one of my top dream trips is hiking the Virgin River narrows at Zion National Park in Utah. This looks even more fantastic with the blue water and waterfalls. Mary, that sounds like another amazing canyon trip. I have heard the canyons in Utah are spectacular. We will have to add that to our list as well. Thanks for the heads up! wow!!!! great pic! thats wonderful…i wish i could do those trips … i am getting panicked …. but the pics makes it possible for me! Nella, you could totally do it. The water is shallow and the guide is very experienced. It was really fun and not stressful at all. i am sure the guide is perfect! Quite an adventure you had there, guys! The photos look great too: seeing those canyons, we felt like watching Star Wars again! Haha, a lot of scenery reminding you of Star Wars eh. It’s funny you mention it, because while we were in Jordan, I had thought of how much I would like to go to Tunisia to see where Star Wars was shot. For me, most of Jordan reminded me of Indiana Jones. The third one was shot here. Cool eh. Looks like a blast. 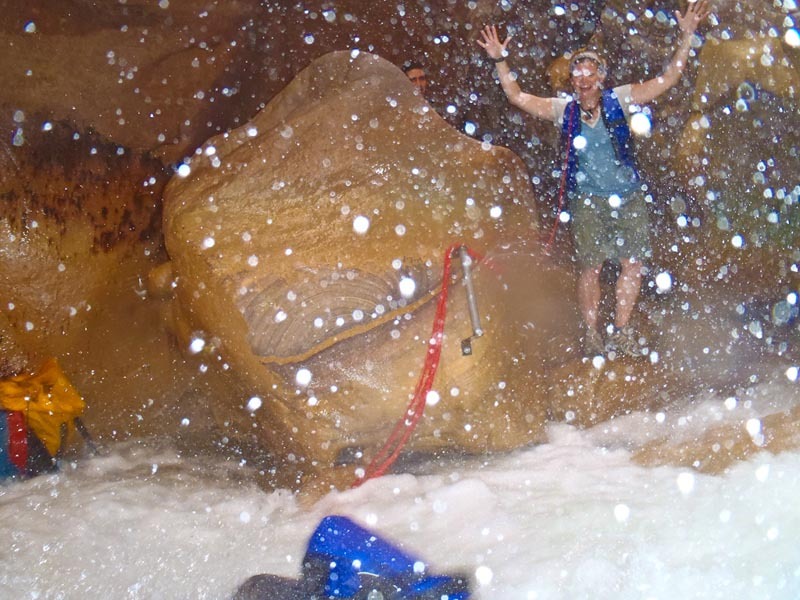 Canyoning is definitely something we’d love to try.